Be creative with party themes! Finding creative party theme ideas can turn a party into a sensational event. A theme can set the mood for the day and will transform an ordinary event into something unforgettable! The possibilities are endless when it comes to party themes. Depending on the age of the guest of honor and the people invited, create a theme around their interests and surprise them with something out of the ordinary. What little girl wouldn't want to be a princess for the day? For that special girl, surprise her with a princess-themed party. From playing princess games to dressing up, there are endless ideas for fun with this themed party. USe your creative party theme ideas for the decorations as well. Display princess-like items such as tiaras, glitter and anything sparkly. Be sure to include lots of pinks and purples, the more frills the better. 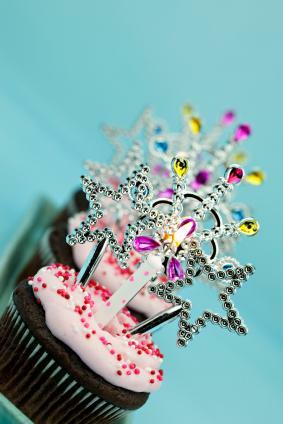 Be sure to have a tiara for the princess to wear throughout the party to make her feel special. Wanting a theme for a cocktail party? Create a theme around a specific drink. For example have a martini-themed party. Decorate the room with oversized martini glasses filled with snacks. Display cutouts of olives and other martini garnishes. Have an assortment of martinis at the bar. From apple martinis to the classic vodka martini, the possibilities are endless. James Bond was known for his love of the martini, so consider incorporating James Bond into your party theme. You can also use a wine tasting theme for a party. Have several wines on hand for your guests to sample and enjoy. Pair the wines with different cheeses and offer an assortment of appetizers as well. This theme can be used for anything from a simple gathering of friends to a more formal party. Let the decade that the guest of honor grew up in be your theme. If your guest of honor grew up in the 1970s then center the party on a disco theme. Hang a shiny disco ball in the center of the room, play disco tunes and let everyone dance the night away. It would even be fun to have everyone show up in disco era clothing. You can use anything that is of interest to that the child, from Barbie dolls to bicycles. Finding a creative party theme can set the mood for the entire day. Pick something that the guest of honor and those attending the party will all enjoy. Once you decide on a theme, be sure to carry it throughout the party. Begin by sending out invitations featuring the theme and decorate accordingly. Feature food and games that relate to the theme.